Teardrop Factory are a lo-fi, psychedelic infused, indie rock band from Brighton, UK. ‘Topshop’ is their debut EP and features 4 songs, clocking in at just 12 minutes. Each of the songs are perfectly formed 3-minute pop tunes – sugary sweet melodies but served up with a monotone grittiness. First track, “Better Company”, opens with a riff that instantly recalls the melody of The Buzzcocks “Ever Fallen In Love” but has the appeal of The Jesus and Mary Chain. A hooky and upbeat number lavished with psychedelic hues not unlike that of TOY. A brilliant introduction to the band. “Vanity Unfair” is a brilliant shoegaze track that opens with a detuned distorted bass riff and eerily slow tambourines. Like early morning sun rays, summery accents appear coupled with with female vocal “ahhhhhhs” giving the song a sweetness juxtaposing its plodding lo-fi sound. Again, this track is sure to appeal to fans of TOY. Accentuating sunny vibes even further is “Stolen Sky” – here Teardrop Factory entice listeners like fellow South England lo-fi shoegaze act, Bos Angeles (read our review of last year’s ‘Taking Out The Trash’ by Bos Angeles). Finally, the EP’s title track is a gem of a song and sounds genuinely vintage. Summoning The Byrds, “Topshop” is a psychedelic 60’s inspired charmer. 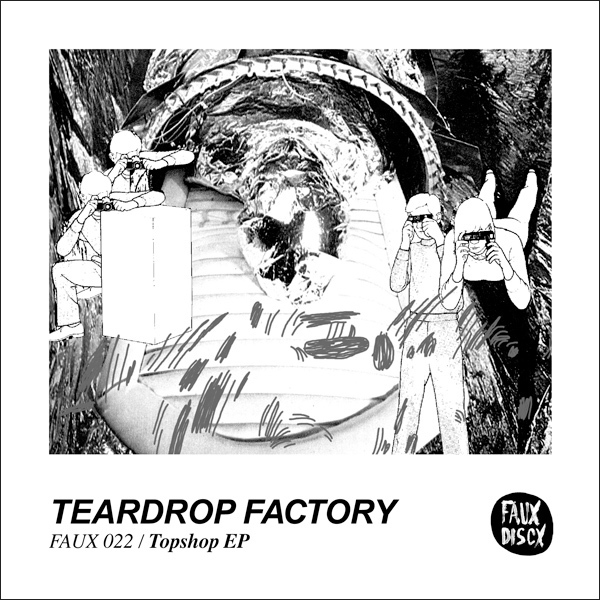 The ‘Topshop’ EP will be released through Faux Discx (home to recent releases from Hookworms, Cold Pumas, Sauna Youth and Vision Fortune) on 27 May , 2013. The EP will be a run of 300 hand-numbered 7”s (marking the beginning of Faux Discx’s new ‘Monotone’ 7” series) as well as digitally via all the usual outlets.